These are heady times for yeast aficionados, East Coast Yeast blazed a trail for small artisanal yeast labs, and it was only a matter of time before others would follow suit. There is a small handful of startup yeast labs popping up all over the country with new interesting strains of yeast but it wasn't until recently that one of these new labs really caught my attention, and pulled away from the pack quickly. Exploding on to the scene this year was The Yeast Bay, a small but burgeoning artisanal yeast lab founded by Nick Impellitteri and crew, located in CA. What grabbed my attention initially, and I would assume others as well, was their Vermont Ale culture, which we all know is the highly sought after Conan (don't we?). One thing that sets The Yeast Bay apart from other new labs is that they have contracted with White Labs to bank and package their vials, so you know you will be purchasing world class cultures. Once Nick released his line of strains for sale I noticed they have a lot more that I am interested than just the Vermont Ale. As a fan of Saison and Brettanomyces I grabbed a few strains that were of interest to me. The three yeast blends, Beersel, Brussels, Lochristi, but the one that really got me excited was the Wallonian Farmhouse strain. Wallonian huh? The name even had me interested. Here is what they have to say about the strain on their website. There is a lot to like about that description, "absurdly high attenuation" and "slightly funky and tart" sound perfect to me. I wanted to get an idea of what this strain can do so I decided to use my Farmer In the Rye Saison recipe since I am very familiar with the beer and have tried many different Saison strains in it over the last few years. I brewed a 15 gallon batch and split it a few ways, ~9 gallons got Wyeast 3711 for primary which was then split between the three Yeast Bay Brett Blends in secondary (more on that in a future post). The remaining ~6 gallons got a healthy 1.5L starter of an absurdly fresh(I think it was 10 days old) Wallonian vial. 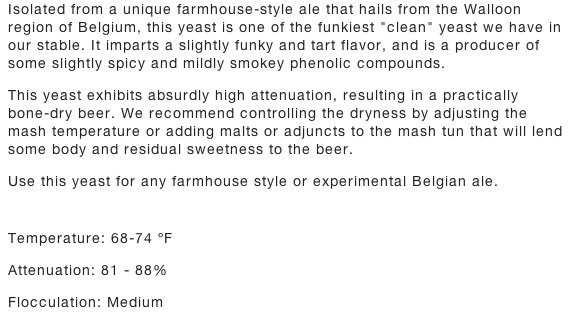 The following is information on the Wallonian strain fermentation only. I aerated for 45 seconds with pure o2 through a stone and pitched the entire starter at 64 F, I didn't have enough time to crash and decant the starter. Fermentation was active within 4 hours, showing some light foam on top (below) at 66 F. There was some moderate co2 off gassing at this point. By 30 hours into fermentation things were really getting going at 71 F, with a frothy white krausen and a steady bouncing airlock. After 48 hours of fermentation we reached high krausen at 73 F, which was pretty fast but a fresh healthy pitch and aeration will do that for you. About 3-4 days in and the krausen started to fall but I kept the temperature at 74-75 F for a full 14 days, throughout that time there was lingering fermentation with tiny bubbles shooting to the surface. There was never more than a 1-2 inches of krausen on the beer as you can see below, but there was very vigorous fermentation that was fast and efficient, with some time at the end to work on the more complex sugars. 48+ hours into primary fermentation, high krausen. The final gravity was 1.007 down from 1.060, a dry beer indeed, especially with a modest Saison fermentation profile that only maxed out at ~75 F. I racked it to a keg on the 14th day and put it on 30psi for 6 days then tapped it on the 7th day, so 21 days grain to glass. Below are my tasting notes about 30 days from brew day. Appearance: Hazy golden color with a white frothy 2 finger head, tiny bubbles shooting up the glass. Still a bit early carbonation wise, but passable. Significant lacing on the glass throughout. Aroma: Notes of hay, coriander, some black pepper, earthy, reminds me of pulling dandelions. There is a subtle lemon zest aroma as it opens up. Mild funk is certainly a great way to describe it, the aroma is classic rustic Belgian Saison. The whole aroma smells like walking into an Herb garden in late spring as everything around is full of life just starting starting to flower. Taste: There is a dry bitterness on the front of the tongue that quickly rakes across your tongue with earthy pepper notes. It then finishes and lingers with a faint tartness on the back and side of the palate. I get a significant crisp malt presence in this beer that I have never gotten before, the Pilsner is upfront and on display. In the past this beer had no real Pilsner character but with the Wallonian strain you can taste a beautiful Pilsner note that gives way to spicy Rye earthiness, the malt and yeast character really blend well together. Overall Impressions: This beer, which I usually love with 3711, has been taken to another level with the Wallonian strain. I actually didn't think that was at all possible, after all the 3711 version took 2nd place and scored a 40 in the first round of NHC 2013, but this version is significantly better than brewed with anyt other strain. If I told people I used spices in this beer they would believe me, not in a heavy handed way but a subtle balanced spice that ties everything together. Then you add in the Pils/Rye malt that seems to be amplified instead of over shadowed its really a nice ride of flavors. There is something about this strain , even with a modest low 70's fermentation, that seems to tie everything together beautifully. The Wallonian strain has a permanent spot in my homebrewery, the subtle spicy and dryness that all ties together well with the other flavors is exactly what I am going for in a classic Saison. Next I will put Wallonian to the test at some higher temperatures and something hoppier and more modern in a new batch of Jah-Rod. ***On a semi-related side note, Nick from The Yeast Bay posted on Reddit that they were looking for Beta testers for some new strains he recently isolated. 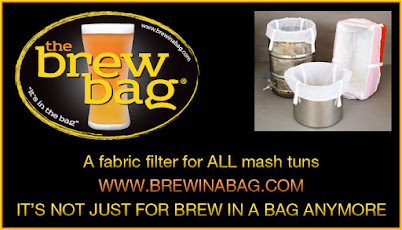 I am pleased to announce that he selected myself and two other homebrewers as Beta testers for some possible upcoming strains of both Sacchromyces and Brettanomyces. So be sure to check back soon, I will have a post coming on the split batch with all three Brett blends and results from the strains we will be Beta testing. Very exciting stuff coming up, and I am honored that Nick has given me the opportunity. Misc: 45 seconds of pure O2 for each carboy.Filtered Philadelphia Tap water, Baxter Plant, 7.9 grams Gypsum, 2.1 grams Baking Soda, and 1.4 grams Table Salt in the mash. Notes: Unimportant to the Yeast Bay stuff, this was my first time using Avangard Pilsner and the PPG must be significantly more then they post on the malt analysis, there is no way I am getting 91% efficiency. I've already brewed Jah-Rod again with it and again I over shot by 10 points, on each occasion I modified the hopping slightly to stay in line with the recipe. In hindsight I should have just watered down the boil and went with a higher volume but I tend to like to run with it and adjust for next time. So the "mild funk" you got from this strain is more earthy than, say, barnyard? I was a bit wary of it based on the description, because I'm not so keen on some of the phenolics you can get from some brett strains. But your write up makes it sound really nice. No barnyard, its an earthy Belgian funk but no Brett like phenolics that I was able to pick up. But a very unique earthy rustic profile. Coff - did you add the three vials of the different Brett strains to this beer, or was that in a different batch? P.S. I subbed your blog via email, but I'm not getting the emails! Any ideas? Its the same beer but the primary strain was 3711 for that portion. Confusing I know, I might not have done the best job at at explaining that. ~6 gallons primary with Wallonian, ~9 gallons primary with 3711 and then split into 3x 3 gallon portions that got each Brett blend. Ah man, I am sorry to hear that. I have never tested it out, I will investigate and get back to you in it. Sorry, I just assumed that would work, woops! Thanks Chris, thats awesome, I think you'll really like the strain. Thats quite a tribute from a brewer of your caliber. Ed, My caliber is a stretch for sure. I do however love to brew solid recipes and this looks like one to me. My yeast arrived in the mail today. Nice writeup. I finally got around to brewing/using my Yeast Bay vial yesterday in a saison. Quick question: I saw you mentioned a modest temperature of ~75F for fermentation, would you recommend going higher? The reason I ask is I did a 10 gal batch (Wallonian Farmhouse and ECY14 split) both fermenting in the same fridge with a heat wrap sitting between them warming up the chamber. The issue I'm pulling my hair out over is there is only a small overlap in the temps (YBW: 68-74F ECY14: 75-82F) and was wondering if I could push the Wallonian strain a little higher. What do you think? My second generation pitch went into a new batch of Jah-Rod, I pitched cool 65-67F and slowly ramped it up to 80f on the 7th day. I held it at 80 through 14 days and then kegged and dry hopped it. The AA% was exactly the same as this batch, finished at 1.006, Jah-Rod is a very heavily hopped beer so its hard to tell the difference but can't say it hurt or helped the beer in anyway. But it did work fine as the beer is very tasty. I think you would be perfectly fine pitching both cool and ramping them up to 80f slowly after a week, cool in the beginning to suppress some hot alcohols then ramp warm to help it full attenuate no need to quickly ramp Saison yeast, give them a nice steady comfy ride up in temp. Let me know how it comes out. Cheers! Took a gold in a small local competition with a beer based on this recipe. Cheers! Hey thats awesome, cheers Amos! Going to brew this tomorrow am for a small club competition, using 3711. Wish me luck! Good luck! Love to know how it came out. I've never used cane sugar in a recipe. When do you add it? The beginning of the boil? Late boil, 5 minutes or so. I sometimes add it into primary as a simple sugar solution, add it just as krausen starts to fall. The idea behind that is to get the yeast to focus on the malt sugars first and then feed it the simple sugars. Reduces possibilities of fusels or over stressing the yeast. Brewed this last week, can't wait to try it. 10 gallons, split into two five gallon batches, one will get some Dirty Dozen from East Coast. That sounds like an amazing split batch. Nice work, hope you enjoy it as much as I do! what is the name of the glass you use in this picture, my local brewery had some for a while but sold out before I could get my hands on one! It's an Italian made glass called a Teku. They used to be hard to come by but can now be easily found online. cheers :) love the blog, keep bringing the funk my man! Brewed a 10 gallon batch of this split into two carboys, one got a dose of Brett Brux after primary fermentation. Just kicked the first keg and I have to say that is was a great beer. I am curious how yours changed over time? Initially the beer was cloudy with a nice spicy saison character and a hint of the rye, by the last few pints it was crystal clear and dare I say....lager ish! I don't think this is a bad thing, everybody really enjoyed it, but all agreed that It was almost as if we were drinking a "Belgian lager", a damn good one. Clear, super clean and crisp. I will definitely be brewing it again. The half with Brett is chugging away with a nice pellicle, should need another couple months. I will report back once it is kegged and ready. Thanks for recipe, cheers! Tasting Notes: We Talkin 'bout Practice?